The Council on International Education Exchange (CIEE) and the Penn Center for Minority Serving Institutions (CMSI) would like to recognize the 15 leaders of Minority Serving Institutions (MSIs) who have demonstrated their commitment to democratizing study abroad by matching CIEE’s $1500 grant to their qualified students who applied for the prestigious Frederick Douglass Global Fellowship Grants. The Frederick Douglass Global Fellowship, named in honor of Frederick Douglass, the renowned African-American social reformer, abolitionist, orator, international best-selling author, and international statesman, covers all program and travel costs for 10 outstanding MSI students each year to participate in a summer study abroad program focused on leadership and intercultural communication. The third cohort of Frederick Douglass Global Fellows will study in London during the summer of 2019. 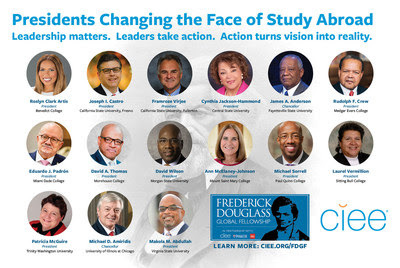 This year, a record-breaking number of students from nearly 100 exceptional colleges and universities applied for the Frederick Douglass Global Fellowship and ALL qualified students who completed their application but were not chosen as Fellows will still receive a $1500 grant from CIEE toward a 2019 summer study abroad program. In addition, for students from the 15 institutions that are matching the CIEE grant, the total support will be $3,000. Launched in 2017, the Frederick Douglass Global Fellowship is just one example of how CIEE and CMSI are working to increase diversity in study abroad by breaking down the barriers of cost, curriculum, and culture that prevent students from participating in international education experiences that can positively impact their lives and futures. The Penn Center for Minority Serving Institutions brings together researchers and practitioners from Historically Black Colleges and Universities, Tribal Colleges and Universities, Hispanic Serving Institutions, and Asian American and Native American Pacific Islander Serving Institutions. The Center’s goals include: elevating the educational contributions of MSIs; ensuring that they are a part of national conversations; bringing awareness to the vital role MSIs play in the nation’s economic development; increasing the rigorous scholarship of MSIs; connecting MSIs’ academic and administrative leadership to promote reform initiatives; and strengthening efforts to close educational achievement gaps among disadvantaged communities.